"In the backyard at 20 East 127th Street, (Mr. Langston’s home) where the lawn in the summer of 1954 was dense and green, a gardener named Mr. Sacred Heart, a follower of the evangelist Father Divine, planted some flowering shrubs. In front of the house, at Langston’s request, someone planted Boston Ivy that crept up the walls and eventually luxuriated, so that everyone knew in which house on the street had lived the poet Langston Hughes. But most of the patch of earth beside the front steps, about six feet square, was barren from years of trampling by neighbourhood children, who had little time for flowers. Langston decided to rescue it, and teach the children a tender lesson at the same time. He named the plot their garden. From Amy Spingarn’s home upstate in Dutchess County came nasturtiums, asters and marigold. Under his supervision, aided by Mr. Sacred Heart, each child chose a plant, set it, and assumed partial responsibility for weeding and watering the garden. On a picket beside each plant was posted a child’s name. 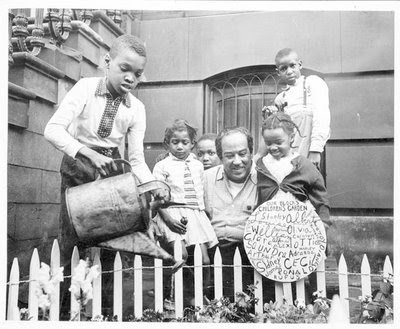 Proud of the garden, which flourished, and prouder still of his children, Langston was photographed at least once beaming in their midst." How could you go wrong with a gardener named Mr. Sacred Heart? What an inspiring story. Thank you so much! Wonderful story - thanks for highlighting. Your blog is a wonderful treat to visit.